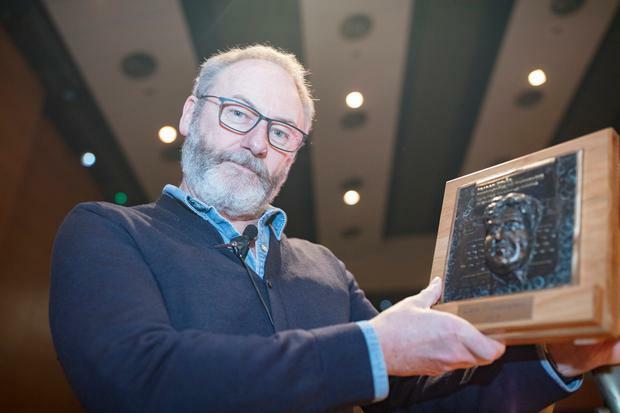 Internationally acclaimed actor Liam Cunningham has received the DIT Brendan Behan Award. The award was made in recognition of his contribution to the arts and his humanitarian work. Students of Dublin Institute of Technology societies presented the award yesterday on their Kevin Street campus, after which the award-winning actor spoke about his career and his work raising awareness of the harsh conditions facing refugees fleeing conflicts in South Sudan and Syria. The 'Game of Thrones' and 'Breakfast on Pluto' actor was once a DIT student - his first career was as an apprentice electrician for the ESB and he trained in the Kevin Street campus. The DIT Brendan Behan award was set up in 2016, and Glen Hansard is a previous recipient.